Paris is full of wonderful sights: historical monuments, museums, art galleries, the River Seine, many parks and gardens. 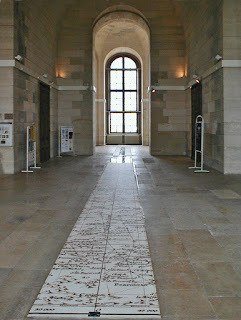 But one interesting historical feature of the city is more virtual than physical: the Paris Meridian. Lines of longitude go from pole to pole, through the equator. The prime meridian is the line arbitrarily chosen to be 0° longitude and is used as the basis for drawing maps and calculating the local time. 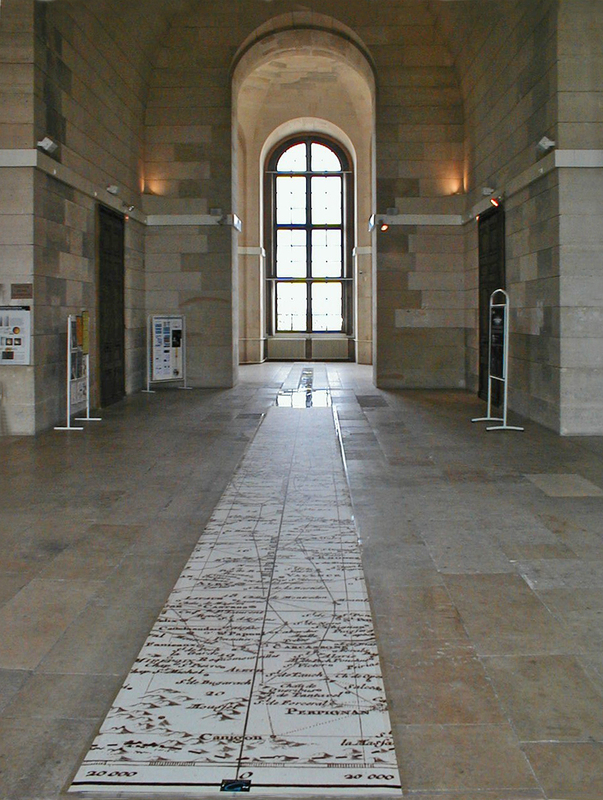 The Paris meridian, which goes through the Paris Observatory, was established in the 17th century. François Arago used this line as a starting point for his precise calculation of the French prime meridian. Historically, each country had its own prime meridian, which made international navigation confusing. This problem was solved in the 19th century, when an international committee selected the Greenwich meridian to be the common zero of longitude and standard of time reckoning throughout the world. Most of Europe and North America aligned their clocks with Greenwich, but France maintained Paris time until 1911 when it at last fell into line with the international community. So, the Paris meridian, used for over 200 years, was no longer relevant. But it didn't disappear entirely. It can be traced today thanks to a work of art by Dutch conceptual artist, Jan Dibbets. 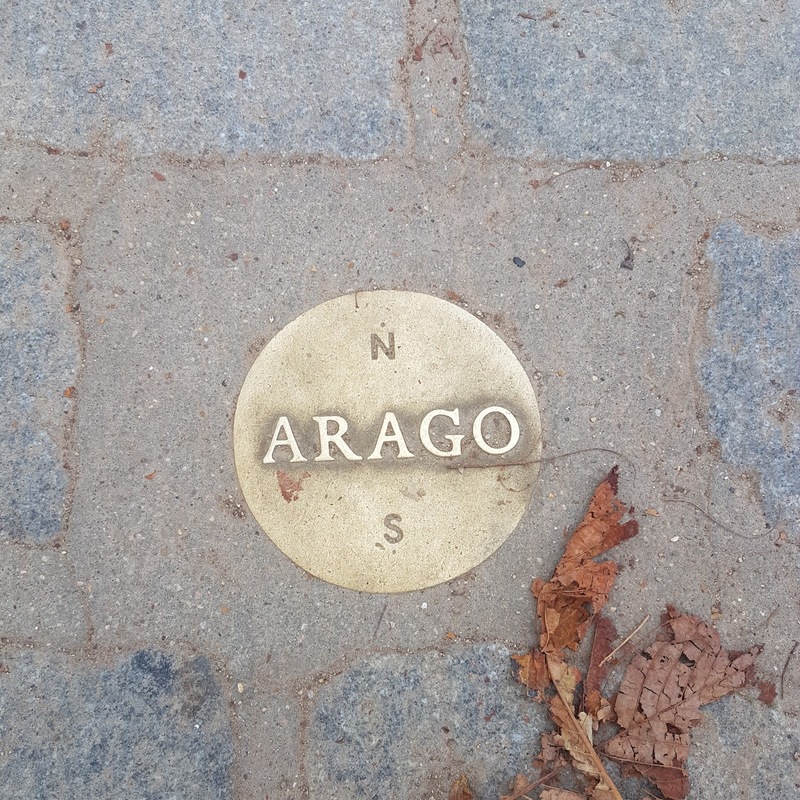 Homage to Arago is an "imaginary monument on an imaginary line" – a series of 135 bronze medallions planted in the ground along the line of the meridian. They run right across the city from Porte de Montmartre in the north, through the Louvre, the Luxembourg Gardens, and the observatory, to Cité Universitaire in the south. Each medallion is 12cm in diameter and marked with the name ARAGO plus N and S pointers. Sadly, some of the medallions have vanished over the years; some were stolen, others removed during roadworks and never replaced, or simply covered over. One of them is appropriately placed at the point where the meridian crosses the Boulevard Arago. It is on the plinth where a statue of the astronomer once stood until it was removed by the occupying powers in 1942. 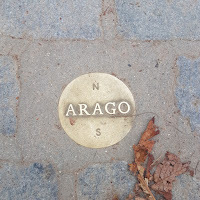 Arago’s statue has disappeared, but the Paris meridian remains.